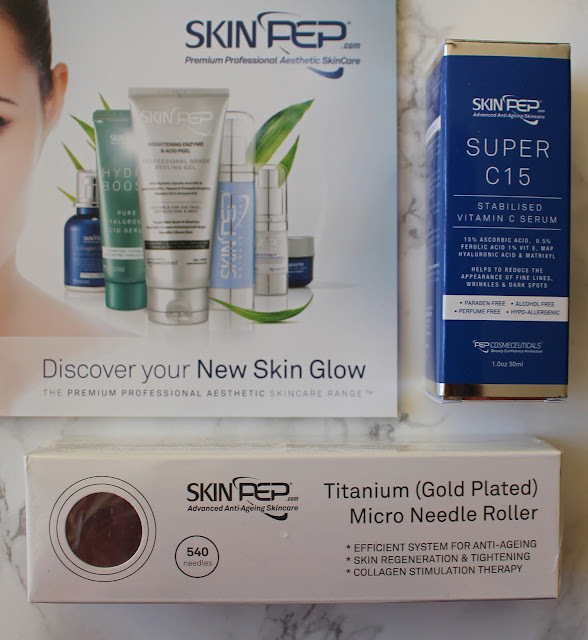 My fourth purchase from Skinpep has arrived (I am in love with their skin care) and this time I was interested in two new products - Titanium Micro Indentation (540) Roller and Super C15 Serum. I've never used any collagen treatments before! 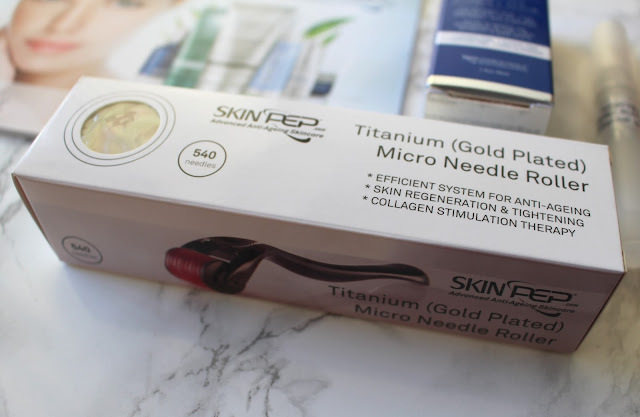 Titanium Micro Indentation (540) Roller (£19.99) is a treatment for fighting fine lines, wrinkles, stretch marks, acne scarring and hyper-pigmentation. 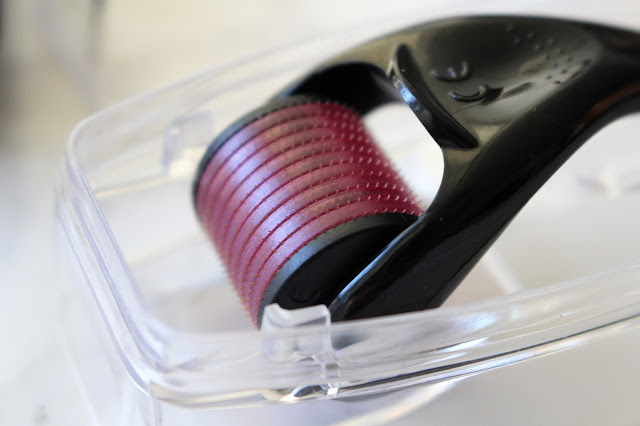 This roller stimulates collagen and elastin production in the skin without damaging it. 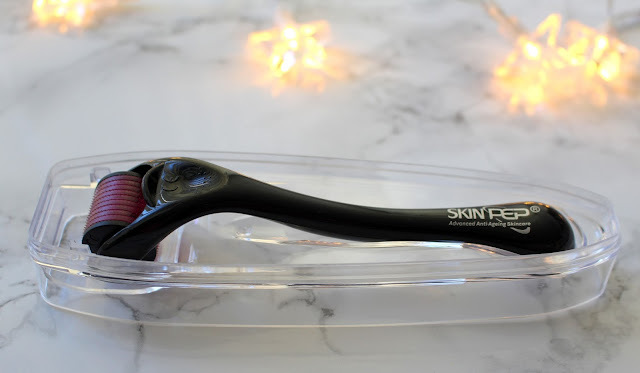 I have been using this roller once or twice a week on my face and neck after my evening shower, although it can be used almost every day depending on your skin tolerance. The biggest problem with my skin is red marks and little scars. After rolling, my skin is sensitive and is a bit red but this soon disappears. Every time I have used this, I have noticed an immediate change - my skin is evenly toned, smooth and my complexion has improved significantly. 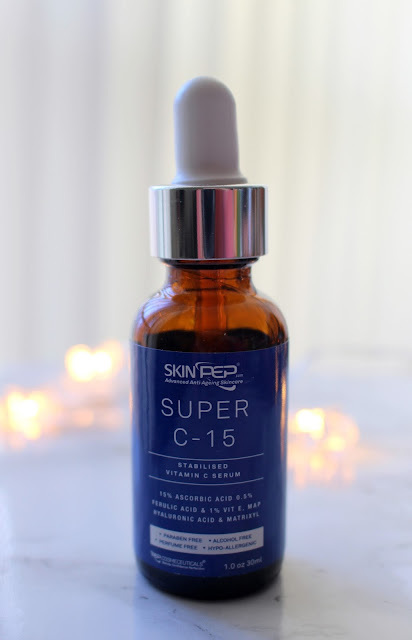 Super C15 Serum (£49.99 for 30ml) is a skin firming, super antioxidant for the skin and works perfectly with a Micro Roller. This serum contains 15% stable Vitamin C and Hyaluronic acid, giving the skin maximum protection and is suitable for all ages and skin types. The serum lightens and brightens complexion, helps to repair spots and sun damage. The main thing I like about this product is that it's so light and non greasy - it absorbs very quickly into skin. The serum is completely safe to apply to the skin after needle rolling and can be used both with and without a needle roller. It is alcohol, artificial dye, paraben and perfume free and only 3 to 4 drops are required on a freshly cleansed face and neck. I've noticed that the serum calms the skin and makes it super smooth and soft. When I wake up in the morning, my skin has a beautiful healthy glow. It can also be used under a moisturiser day or night. I think these two products work well together. It almost feels like being at a spa. The massaging experience is very relaxing and rejuvenating and I can have a treatment all by myself in comfort of my own home. 2015 - Did I succeed?